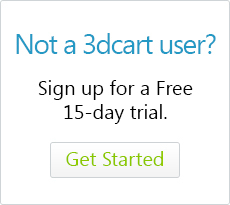 3dcart's built-in blog feature allows you to create a blog within your store with just a few clicks. The Blog automatically uses the dynamic design elements from the website, eliminating the need of re-creating the design elements on a third party location; automatically increase your SEO efforts by having the Blog within the same domain name as the website and store. This article contains the following sections. Please click on a link below to be taken to its respective topic. In the "link" field, enter blog.asp and click "Save Changes." Use this setting to remove linking to your archived blog posts. Use this to configure the amount of recent posts which will be displayed. By default, the default frame will be used, but you can upload your own frame template to be used specifically for the blog. Here you can add your Google+ Authorship URL which will add your Google+ profile credentials to each article posted. Use Disqus as the comment feature instead of 3dcart's built-in comments. Marking this checkbox will enable a previous and next link on each article to allow visitors to navigate prooperly between posts. With the Previous/Next buttons, be aware that the blog is set to display posts in a reverse chronological order - meaning that the newest post will be displayed at the top of your articles list with older posts displayed after it in reverse order. Because of this ordering, the "previous" link will actually point to a newer article while the "next" link will point to older posts. If you'd like, the labeling of the links can be changed in your Store Language section (Settings ->Design ->Store Language). Marking this checkbox will add the ability for comments to be replied to similar to a discussion. This will add CAPTCHA requirement for comments. Enter your Disqus Shortname to link the blog's comments with your proper disqus site profile. This will be the header of your blog's navigation banner. You can use regular text or HTML coding through the WYSIWYG editor. This will be the footer of your blog's navigation banner. You can use regular text or HTML coding through the WYSIWYG editor. You can also create specific categories for your blog postings if you'd like. For example, instead of one huge blog for all apsects of your store, you can have a category specifically for postings about your new releases or upcoming specials while also having a separate category for general news items. The implementation is entirely up to you. Your blog articles will be your individual posts. If you set the article's post date to a future date, the article will not display until that day! From this page, you will have the ability to change the article's short and long content as well as edit its name, post date, author, and post image. You can also take the article out of draft mode by unchecking the "Yes" checkbox under "Draft Mode." The article will not display on your store front if it is in draft mode. Allows you to tag specific products from your store to be added to the blog post. Tagged items will display as thumbnail listings beneath the article. Allows you to preview the post.